Emil Carlsen : Connecticut hillside, 1920. Frame after May, 2017. 1920 Emil Carlsen [1848-1932], the artist . 2016 Sotheby’s, New York, NY, “American art“, sale #9563, October 20. 1980 William Benton Museum of Art, University of Connecticut, Stores, CT, “Connecticut and American Impressionism”, March 17 – May 30. 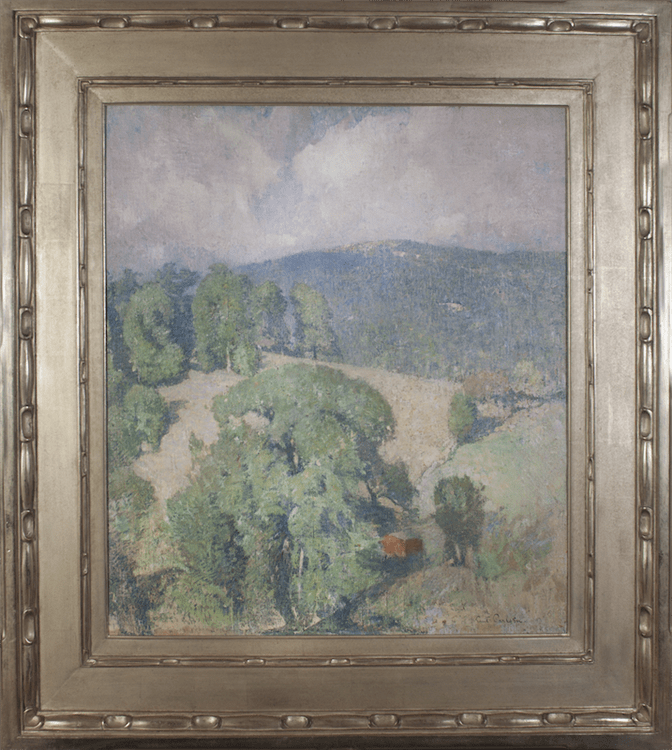 1923 The Art Club of Philadelphia, Philadelphia, PA, “Exhibition of oil paintings by Lilian Westcott Hale, Emil Carlsen, and Charles H. Davis“, February 24 – March 18. 1921 Macbeth Gallery, New York, NY, “Recent paintings by Emil Carlsen N.A. “, February 9-28. – Sotheby’s, New York, NY, sales catalog, “American art“, sale #9563, October 20, 2016, lot #63, illustrated: color on page 50. – “Soren Emil Carlsen: the hammershoi of Manhattan” by Kim Lykke Jensen, Narayana Press, Gylling, Denmark, 2008, illustrated: color, page 73, figure 55. 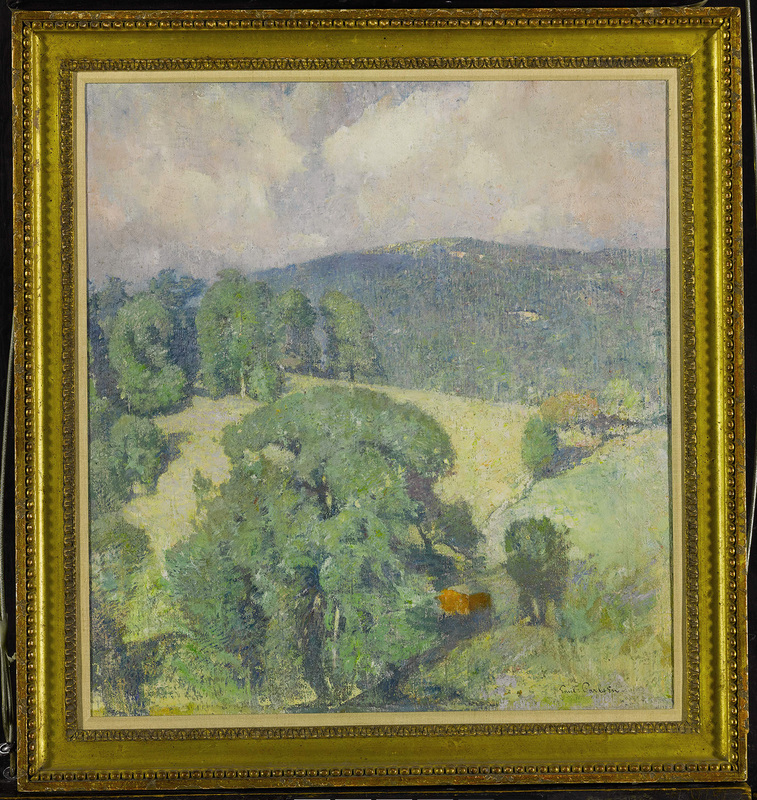 – William Benton Museum of Art, University of Connecticut, Stores, CT, “Connecticut and American impressionism”, March 17 – May 30, 1980. – Art & Antiques, “Emil Carlsen: lyrical impressionist” by Gertrude Sill, March-April, 1980, pg. 88-95, not illustrated, pg. 92. 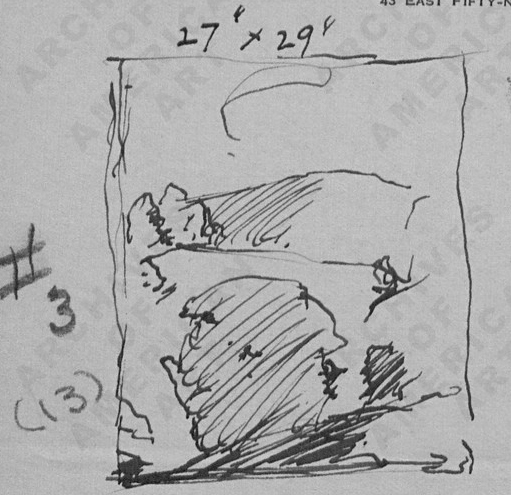 – Art Institute of Chicago, Chicago, IL, exhibition catalog, “A century of progress: exhibition of paintings & sculpture“, June 1 – November 1, 1933, #436, not illustrated. – The Art Club of Philadelphia, Philadelphia, PA, exhibition catalog, “Exhibition of oil paintings by Lilian Westcott Hale, Emil Carlsen, and Charles H. Davis“, February 24 – March 18, 1923, #11, not illustrated. – The Macbeth Gallery, New York, NY, exhibition catalog, “Recent paintings by Emil Carlsen N.A. “, February 9-28, 1921, #11, not illustrated. – Art & Antiques, “Emil Carlsen: lyrical impressionist” by Gertrude Sill, March-April, 1980, pg. 88-95, illustrated: color.